We recently launched a new Sales and Information Manual which contains pearl information, tips and confidence inspiring knowledge. Click Here to request a copy. 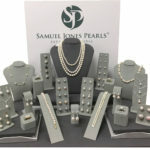 Did you know, almost all of our jewellery can be viewed by navigating to the ‘Jewellery’ button at the top of the page? Copyright © Samuel Jones Pearls 2019. All rights reserved.